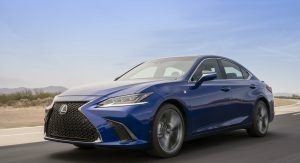 The current generation of the Lexus ES is a popular car thanks to its honest approach to luxury. The model, though, was getting old and had a stale look that didn’t help its case. 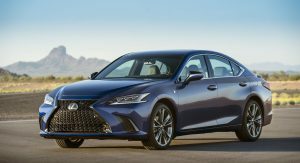 Lexus has fixed these issues and done a lot more to make the new 2019 model an even more attractive proposition. 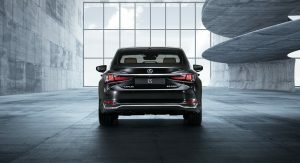 The sixth-gen sedan that will be revealed at the 2018 Beijing Auto Show is much prettier and more tech forward than before. 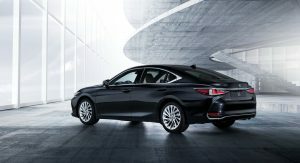 Underpinning the striking exterior is Toyota’s GA-K modular platform, which it shares with the 2019 Avalon. 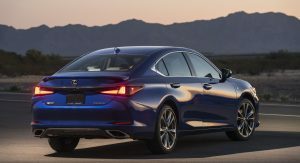 The platform has allowed the sedan to grow. 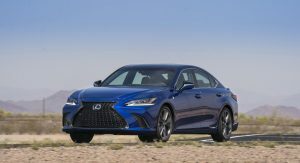 Lexus claims the new ES is 2.6 inches longer and 1.8 inches wider than the outgoing model. 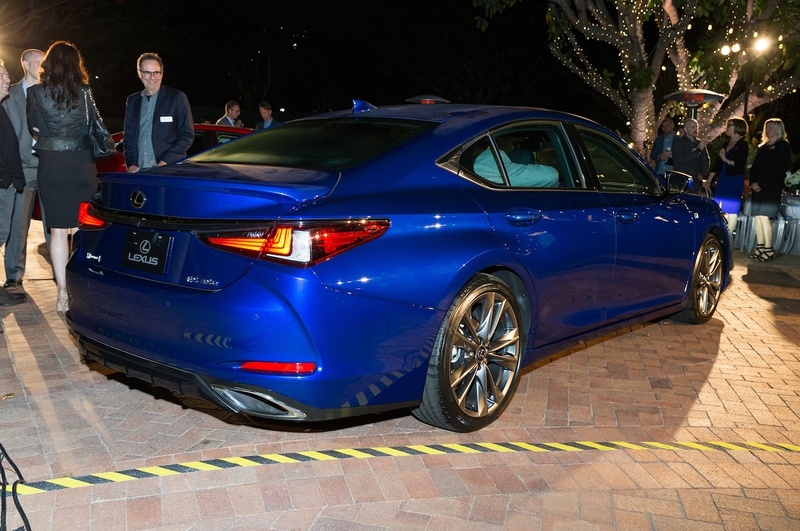 The wheelbase also grows by 2.0 inches. 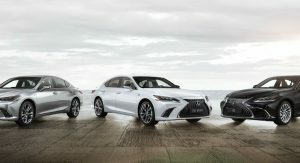 Like before, the ’19 ES will be available as the ES 350 and 300h. 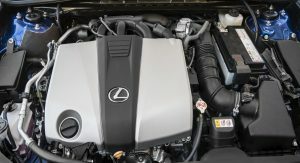 Just like the previous generation, the ES 350 is powered by a 3.5-liter V6. 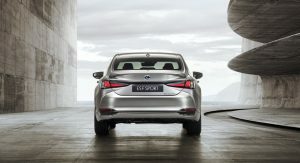 Power, though, is up to 302 hp (225 kW) and 267 lb-ft (362 Nm) of torque. 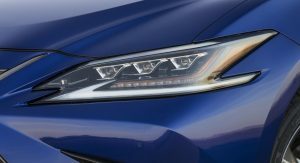 Those figures are a decent increase from the previous generation, which produced 268 hp (199 kW) and 248 lb-ft (336 Nm) of torque. 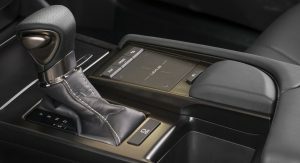 A new eight-speed automatic gearbox also replaces the old six-speed unit. 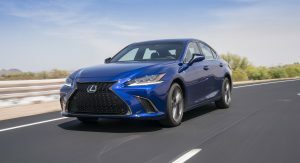 While an all-wheel drive option is rumored to be in the works, the ES is front-wheel drive only for the moment. 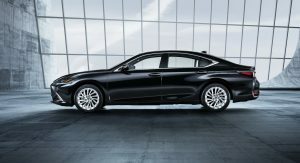 On the hybrid front, the 300h gets various updates that make it more fuel efficient. 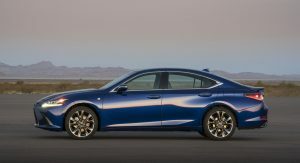 The trim features an updated powertrain that has an all-new nickel metal hybrid battery that’s smaller than before, a more compact electric motor that’s also lighter than the old unit, and an all-new engine. 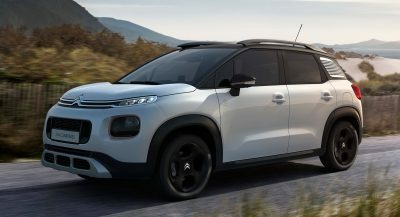 The motor is a 2.5-liter Atkinson-cycle inline-four engine. 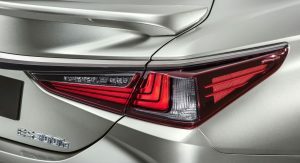 Total output for the hybrid is up to 215 hp (160 kW) from 200 hp. 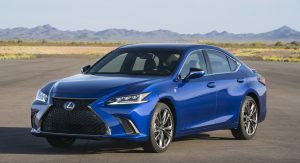 Fuel economy is up too, as the current model has a combined rating of 40 mpg, while the new one is expected to get 44 mpg combined. 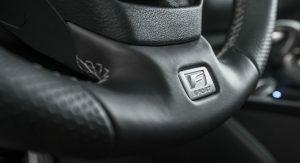 The most exciting bit of news for the ES is the addition of an F Sport trim. 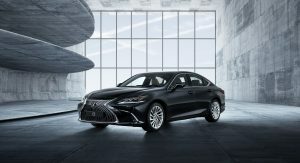 The sportier, more aggressive-looking sedan is only available on the ES 350 and retains the same 3.5-liter V6. 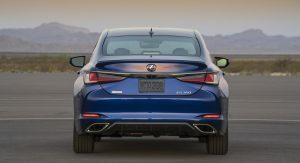 It does come with Adaptive Variable Suspension, though, which we first saw on the LC Coupe. 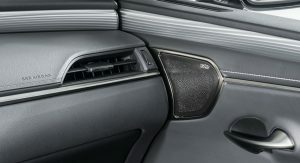 A Sport+ drive setting and an Engine Sound Enhancement feature, which is probably just noise being piped into the cabin, is also bespoke to the trim. Things look a lot better on the inside, too. 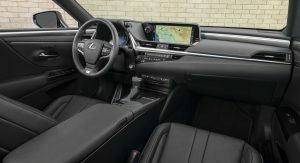 Obviously, the cabin is just as upscale as we’ve come to expect from Lexus with things like real wood and aluminum trim, but it’s visually less cluttered and generally more appealing. 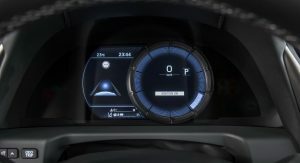 The dashboard is now oriented towards the driver with an interesting cutout for the audio and HVAC controls. 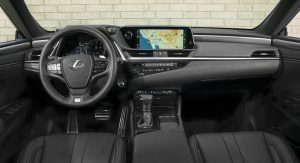 Lexus also mercifully relocated the analog clock that never lined up properly in the old vehicle to a smaller unit that sits directly to the left of the new screen. 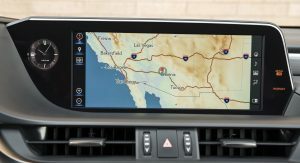 In addition to a new interior design, the ES gets a massive technology overhaul, as well. 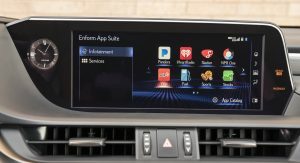 There’s an 8.0-inch screen that sits a top of the dash that can be swapped out for an even larger 12.3-inch unit. 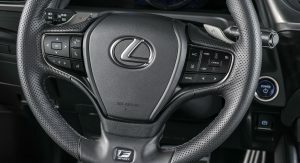 Regardless of what display you go with, Lexus has still stuck with a control pad that sits to the right of the shifter, but it’s not propped up on a base like it was in the old sedan. 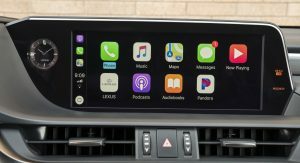 The new ES is also the first Lexus to get Apple CarPlay – rejoice Apple fans – and also comes with Amazon Alexa integration. Built-in Wi-Fi hotspot is also available. 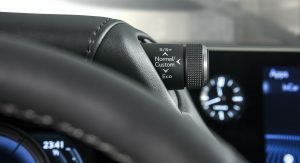 Other new tech features for the ES include an updated instrument cluster and an available head-up display system. 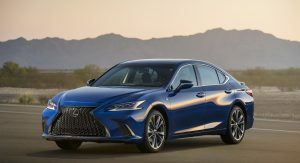 When it comes to safety, the sedan also gets the brand’s Lexus Safety System+ 2.0 suite that comes with a pre-collision system that has daytime bicyclist detection. 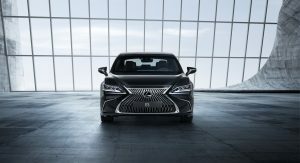 Lexus will show the car off in real life for the first time at the 2018 Beijing Auto Show on Wednesday. 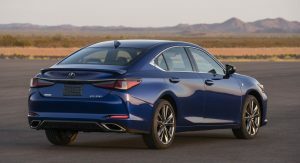 Pricing for the vehicle is expected to come out before the sedan officially goes on sale later this September. Sharp and reliable. Perfect for a wise millennial. 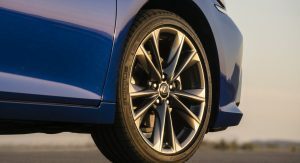 The original press photo made it look quite sharp… however in normal lighting with a standard ride height it doesn’t look as good. 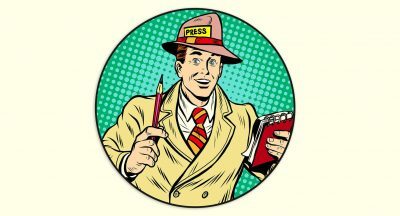 Are you talking about the ongoing model? Cause no one has saw it in person yet! 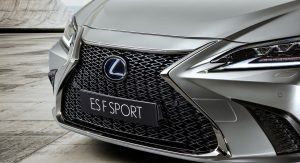 The original press photo was the regular ES model, not the F-Sport model. Suspension changes and the different front end could have made that different effect for you. Looks as expected but good. 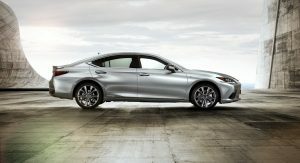 It’s a family sedan so I am not expecting miracles but I think it’s a nice update. Like it better than the old one and better than the Avalon but to bet honest the Avalon looks nice in that red color. I am torn on the interiors. 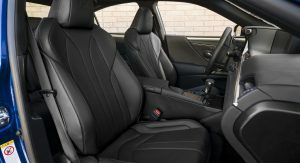 Since I only see the all black interior on the ES I think I prefer the Avalon, however in a lighter color I might like the ES. 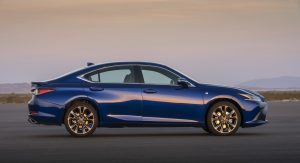 I like it a lot, although I wish there was an added powertrain option to better differentiate itself from the Avalon. 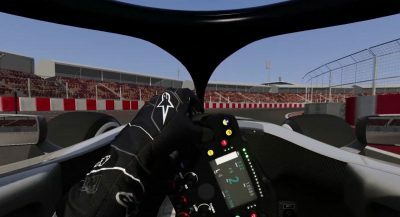 However, I’m sure once the car is fully introduced tomorrow they will announce some of the interior features that set itself apart as the more premium option. 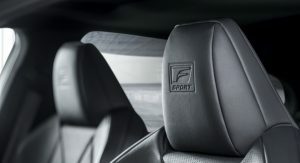 It should be noted that this might not be the best interior shot considering it’s the “sporty” F-Sport interior and not the more luxurious top of the line regular trim. Also, I wish they would include a lithium ion battery instead of the nickel hydride one. 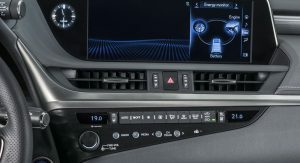 In the base Camry hybrid, the lithium allows it to get 52 mpg. They’d be selling like hot cakes if they offered it to this hybrid. I echo your sentiments about the interior. I am looking forward to seeing the luxury version to see the nuisances between materials. Does not look like new! 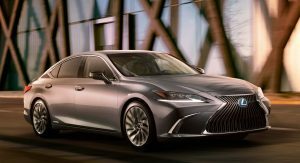 A solid, reliable luxury car. I like the look and only a few things I feel needs tweaking. 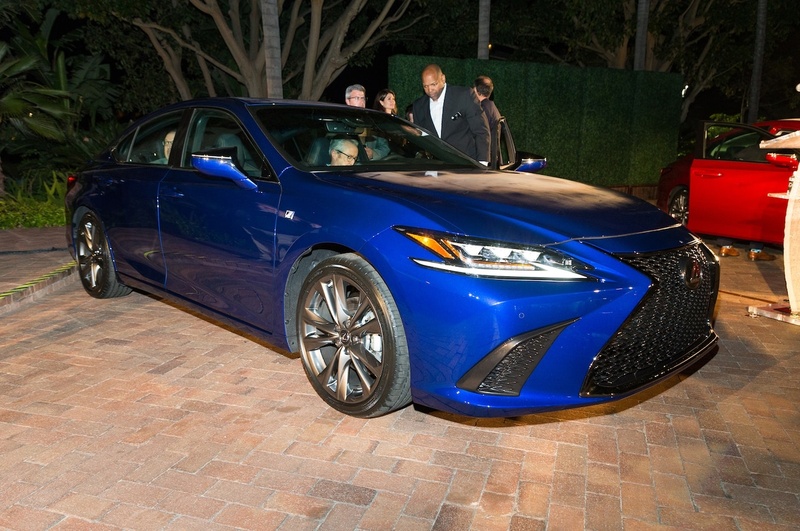 The FSport need to sit a touch lower reducing the fender gap and the interior could use a slight more upscale look…maybe some well place Alcantara in the all black interior. 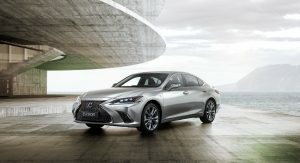 With tried and trusted powertrains and new tech plus offer it as ES220T like Absolut Sabs posted it will be a best seller for Lexus. Looking good. 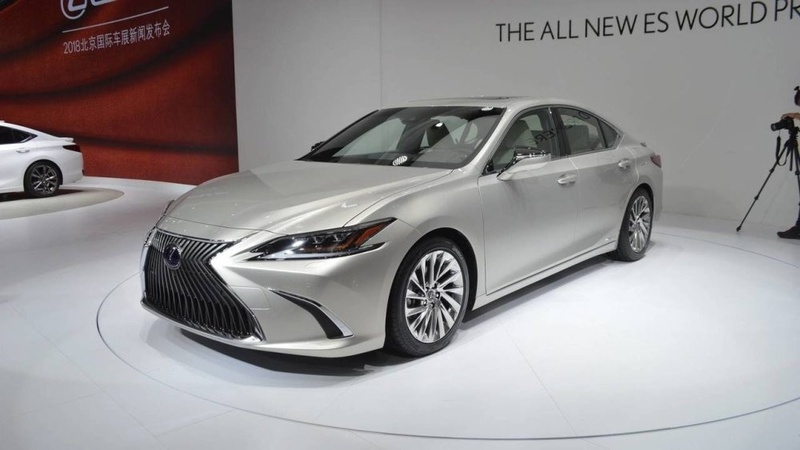 Not a big fan of the spindle grille, but it’s well integrated into the LS and now ES. 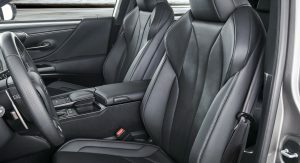 The interior looks good also. Really nothing to complain about except it should be RWD. Personally this is the best looking ES ever. It’s well proportioned, not too many lines like on the RX. 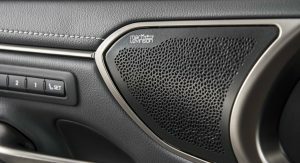 The only item of any interest is perhaps the random pattern on the speaker grille, and even that bears no relation to the rest of the car. I don’t like the Hellboy horns above the instrument cluster. 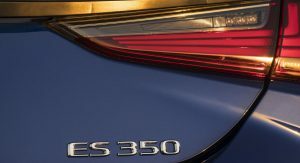 Thought they looked odd on the new LS500, and my opinion hasn’t changed on this model. 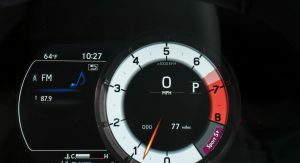 I think it’s because the instrument cluster is so small in comparison. It’s looks fine on the LC IMO. They look like ears on this and the LS. Am I the only one that is bothered by the swath of nothingness beneath the climate control. That looks so weird and unfinished… Otherwise, it’s what you expect the ES to be… I was expecting something different since its supposed to fill the gap of the GS as well… but it’s the same formula. No need for name calling gamboa, would call you an idiot with a deprived childhood but that would not be nice. 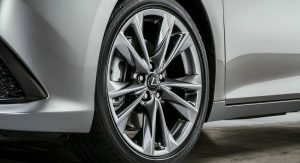 cmon lexus! 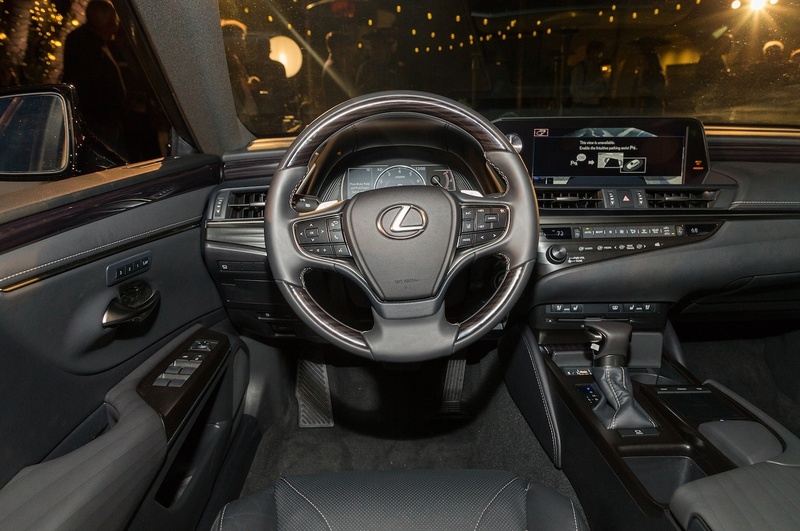 exterior is nice, but that dashboard evoking older RX swoosh is big NO! its already old. you have nice modern dash in UX, really a masterpiece in LC, following with LS…. but this one is one cheap garbage. 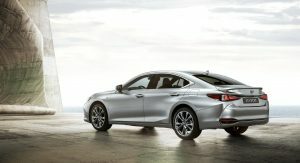 It does look better, but I’m afraid they’re going to drop the GS for this. 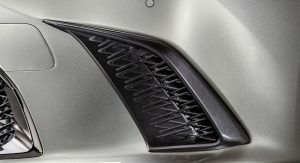 That grille looks tiny compared to the Avalon’s maw, and that’s a good thing. 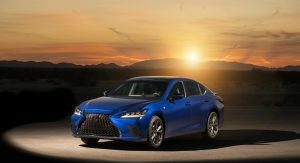 I hope there’s an AWD, turbo-6 variant waiting in the wings when the GS officially walks into the sunset. 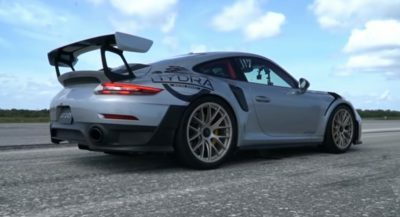 It looks good, well proportioned and a definite improvement over the last gen. 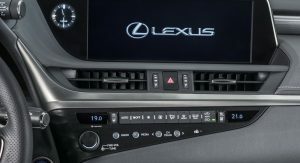 But then again, Lexus falls short of powertrain. No AWD? No new engines? 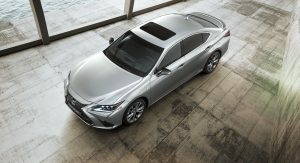 Lexus better not kill the GS…A budget FWD “LS” will not suffice in its segment. An ES that finally looks good. 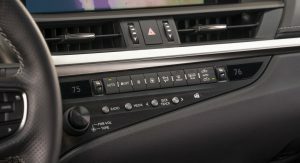 The only thing that I don’t like is the diagonal space underneath the climate control that’s one piece with the top of the glove box. Just doesn’t flow well to me. 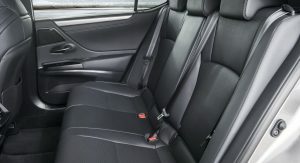 Everything else looks fantastic, Lexus finally put better looking seats in the ES. Actually the examples you gave are not comparable at all. I was referencing the body lines and the whole side of the vehicle. 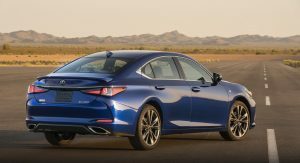 Put a picture of the new Avalon side by side with this vehicle you will see they are the same aside from some minor tweaks. 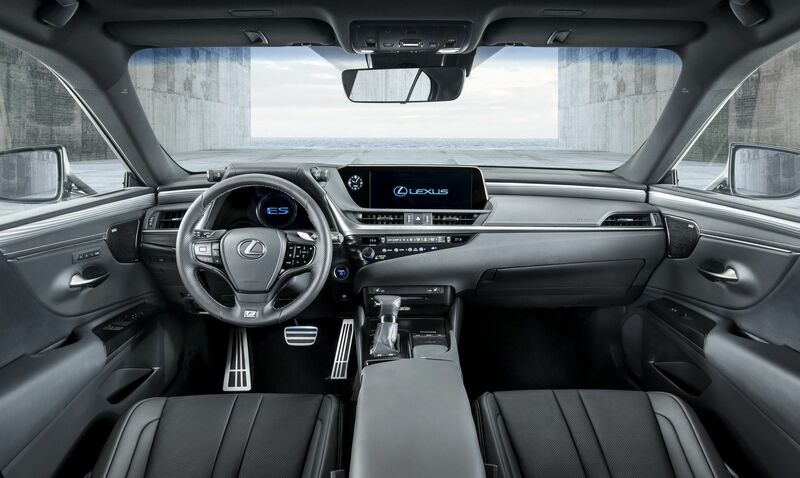 The examples you gave are completely different body styles and vastly different interior. While the Golf R and Audi S3 may share a beautifully engineered german powertrain, they are vastly different vehicles inside and out. You took offence because you know what I said is true and for some reason have some kind of vested interest in Toyota so you turned to name calling real classy. 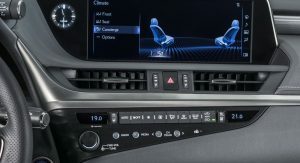 Camry Deluxe or Avalon Lite. Depends on how you process it. 3.5L making 305 hp? Outdated. 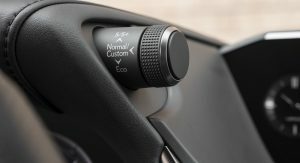 8 speed auto in 2018? Outdated. 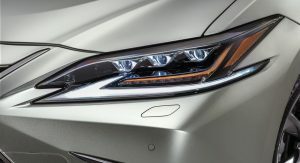 215hp hybrid from the inventors of it? Outdated and pathetic. 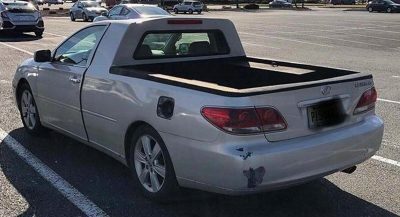 What is this car trying to be? The inside looks techie and austere, hardly the classic sort of design its geriatric audience appreciates. 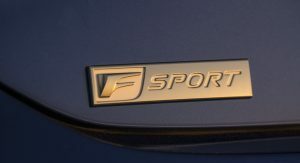 Or is it trying to be sporty? 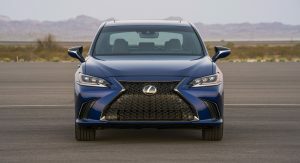 Who on earth would consider a Lexus ES if in the market for a sport sedan? Overall, the car is handsome enough and I guess it delivers just enough of everything. 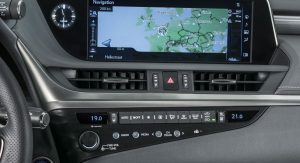 It will sell on its trouble free ownership card and good lease deals as always. 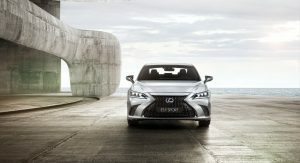 But, my question remains, who will be the first Japanese manufacturer with cars on an order to rival Audi, MB and BMW? 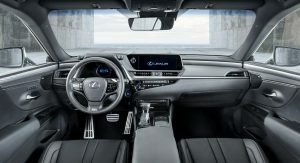 From Acura and Lexus to Infiniti and beyond, they all seem so utterly lost in the luxury segment. Very nice. I can see why the GS was not needed now. 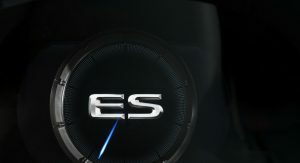 ES FSport is good looking as well. This one should do fine sales-wise. 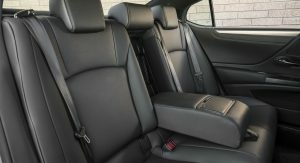 Exterior looks really nice but dunno if interior can compete with 5 series or E class. It will sell like a hotcakes.